List of Petpets that closely resemble Neopets! Description: This is a short story focusing on one my favorite characters on Neopets (Kanrik) and one of my own Neopets Veifira. Description: At the back of the Haunted Woods, there is the Deserted Fairground that offers a variety of spooky foods, shops, and carnival games. Your Neopets can try their skill and luck and try to win exclusive prizes, large jackpots, and even secret avatars! 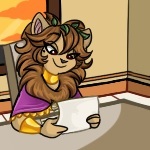 Description: There are many books around Neopia that can be read to your Neopets (as long as they don’t find them boring!) to increase their intelligence. Description: You didn't think Donny worked alone, did you? Description: Valentine's Day doesn't always have to be about gifts! Description: Hey there! We heard you’re planning to throw a party. You’ve already read Flotsam Party Ideas and Gelert Day Party Ideas, but you still need a little more inspiration. Whatever the occasion, whether it is a birthday, celebration, holiday, or simply to have a party, here is your one of a kind guide to throwing the BEST party Neopia has ever seen. Description: Although Neopia is known for its many distinct lands (including even two in outer space), the world of Neopia is actually covered by mostly water! Description: Spring has sprung in Neopia! Description: Time to feed some Kads! Description: April showers bring May flowers! We have already suffered through last month’s rain (although if you ask any Koi, they’ll say it was quite pleasant, actually), and now is the time to reap the beautiful rewards. Description: Have you ever wondered what was in the stars for you? Neopian stars are unique and tell stories all on their own, so we teamed up with the Altadorian Astronomy Club to give you in the depth on all twelve star signs, also known as the zodiac. Description: It was a sunny Saturday morning and Calodrun, a Halloween Bori, was having a cup of Breakfast Tea with Raspberry Scones and clotted cream. He reached over for the newest issue of the Neopian Times, which boasted "ALTADOR CUP PRESS TOUR" across the top. It was all over the news and NeoTV, the Altador Cup, because it was the biggest event of the summer. Description: What happens when one side of your life meets the other? Maybe one day this Grarrl will get his answers....one at a time I suppose.